February is National Embroidery Month! WeAllSew is celebrating with a month-long event sharing our best embroidery tips, techniques, free projects, and bonus giveaways! Visit us every Friday during the month of February to find out what each week’s fun prize package includes, and enter the giveaway. To celebrate the second week of National Embroidery Month we’re sharing our best embroidered monogram tips and techniques. 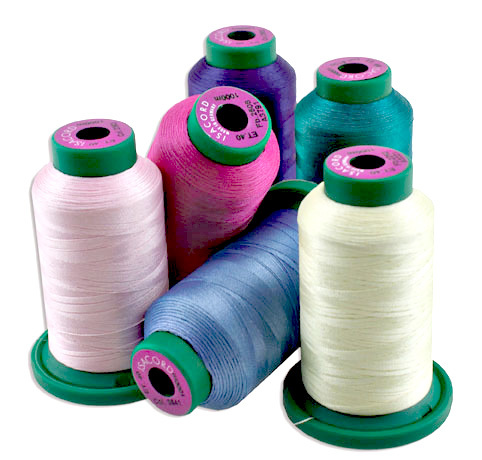 At the end of the post we have a fantastic giveaway with some handy machine embroidery supplies just for you! The classic 3 letter monogram gets an elegant update! 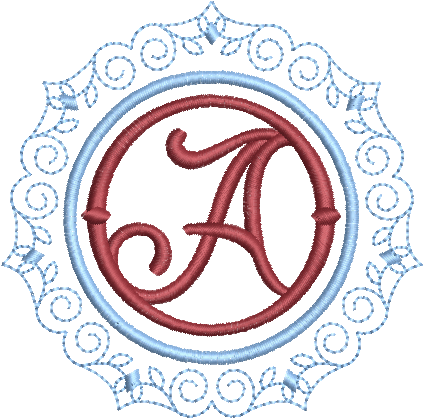 Find tips for creating out-of-the-ordinary monograms in this Elegant Monogram tip post. The 2-letter monogram is probably the most common form of monogramming. That being said, common doesn’t have to mean boring. Learn how to make each monogram unique, as it should be, with these 2-Letter Monogram tips. A single letter is a monogram distilled to its purest form. Whether it is the initial for your family name or to convey simple individuality with your first name initial, that single-letter can combine simplicity and maximum effect. Get a quick lesson in pulling together an elegant One-Letter Monogram in this post. 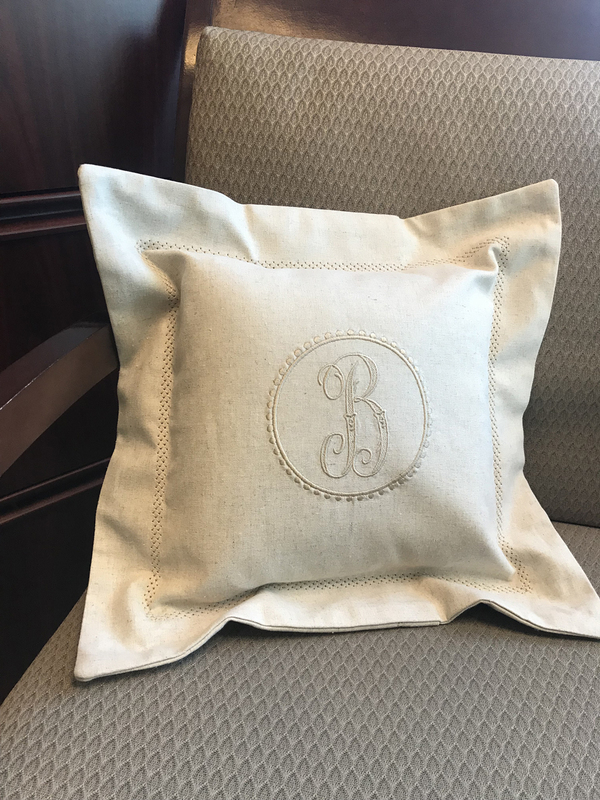 Monograms are a classic way to add a personal touch to your textiles, whether it’s home accessories or staples in your wardrobe. Monogramming can also provide a thoughtful, personal touch to gifts. Traditionally, they might be ornate with script fonts and lots of flourishes. Add a modern, personal touch to a project with a simple Modern Monogram with BERNINA in this tutorial. Monogramming a gift for the guy in your life is a classy way to make it personal. There is something sophisticated and serious about personalizing your belongings this way. With this “no-sew” project you can take your gift giving to the next level. 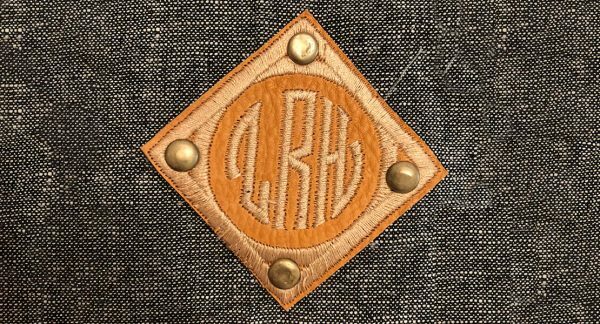 Find instructions to make a Leather Monogram Patch here. Create a very personal decorative pillow by adding a large monogram and pairing with embroidery motifs. Click to find the Embroidered Pillow tutorial here. 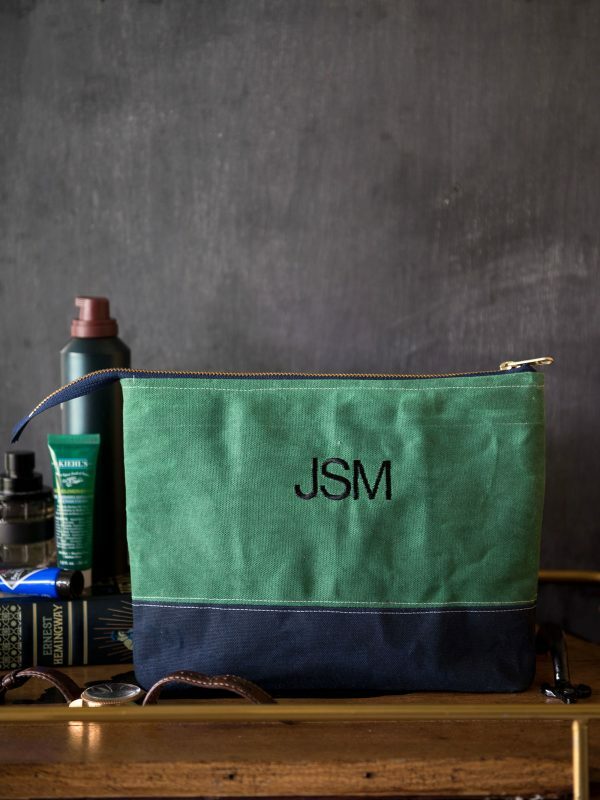 This simple, monogrammed travel bag is made using waxed canvas. If you’re not familiar with it, waxed canvas is canvas that has had a wax coating applied to it. The wax coating makes the canvas thicker and somewhat water repellent. Click to find the Monogrammed Waxed Canvas Travel Bag tutorial here. Add some personality to your wardrobe by creating a removable faux leather boot cuff! Trim with lace or a strip of faux fur to match your winter weather attire. Find the Monogrammed Boot Cuff tutorial here. This contest is now closed. Congratulations to our contest winner, WeAllSew fan @sugarchicken, and thanks to all who entered! One lucky WeAllSew reader will win this embroidery package containing one colorful assortment of 6 spools Isacord embroidery thread, one pair Tula Pink Hardware tweezers, and one rollof Ultra Clean & Tear stabilizer! All you have to do is post a comment below and answer the question, “What is your favorite project (garment, bag, hankie, etc.) to add a personal monogram?” The the giveaway is open through February 14. The giveaway is open to residents of the 50 United States and the District of Columbia. One comment per fan. Comment must be submitted to the WeAllSew.com blog by February 14, 2019 at 11:59 PM Central Time. Winner will be chosen randomly. Winner will be notified by email and will have 48 hours to contact to claim the prize. Currently working on an embroidery block with a home/house theme in variegated blue thread. I enjoy the challenge of this quilt. I love monograms on towels. My favorite project to add a personal monogram is completing a personal touch to a pillowcase. It’s the perfect gift as well. I like the idea of adding an initial to a set of dinner napkins. I am a brand newbie having just unboxed my module this week at the Bernina 3 class at the Atlanta Sewing Center in Duluth, GA. My first project in class which was a single paisley motif in three colors turned out lovely! I’m excited to begin on my own by monogramming small, medium and large stand alone organizer fabric “buckets” made with peltex. These are lovely to make and fill for shower gifts, spa gifts, children’s toys and sewing notions (tons of other uses too). Having a monogram along with a border motif will personalize these organizers nicely! Can’t wait to start creating! I make zipper pouches for friends and family and I like to personalize them with a monogram. I’ve only monogrammed a few things, but I think my favorite so far has been some fingertip towels I made for our guest bathroom. I like monogrammed towels and also shirt sleeve. Since I am still learning, I haven’t attempted to monogram my husbands sleeve yet. I like to monogram cosmetic bags which I give as gifts. My favorite is adding a monogram to a makeup or jewelry bag. 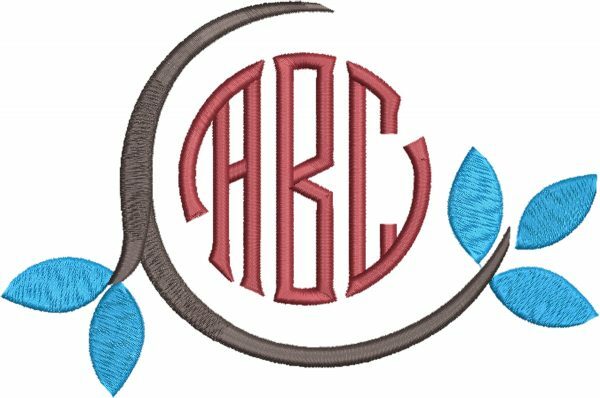 I usually don’t do monograms, I add the person’s whole name to bath towels, coin purses, pillow cases, quiet books, greeting cards and much more. I guess I will have to try a fancy monogram sometime. Thanks for the great ideas. I like to add monograms to bags. Sometimes on the inside, sometimes on the outside. My favorite right now is making decorative pillows with monograms, hemstitching and decorative stitches. My great aunt loves the swirls and curly-cues. I like to Monogram towels. Makes plain towels special. I recently made a Kimberbell pouch. I am very pleased with it. My favorite right now is on a garment for my great granddaughter. I like the ideas you’ve presented. Will have to try some of them. I like to add a monogram or a name to the face masks that I make for cold weathet protection. I like to do pillows for newlyweds and bath towels. I monogram so many items to give away as gifts. I love doing towels and shirts. But my favorite is doing monogram for cards. Sounds silly as most people do not save cards. However, getting a birthday card with a wish with your initials monogramed on the from of the card in fabric is a classic. Monograms do not take a lot of time and the personal touch means so much to the recipients. Right now though, I am going to surprise my son-in-law with a polo shirt with his job logo on it (I actually digitized this on Bernina Software 8). Linens are my favorite for monograms! Pillowcases, towels, etc. I have to admit I love a monogrammed cufflink on a mans dress shirt too! I’ve only made one monogram on a towel as I’m relatively new to machine embroidery and it turned out great. I’m anxious to make some aprons and pillow cases to monogram in the next few weeks! I like add monograms to pillowcases for Neices or nephews, wedding shower gifts. From a large family and lots of weddings. I also Monogram bags and totes. I think my favorite items to monogram are bags, tote bags, makeup bags, handbags, any kind of bag. I like to add monograms to kitchen towels to hang on refrigerators. I’ve enjoyed monograming on pillowcases and sheets. I am new to monogramming and had a great time doing a hand towel in Christmas colors in my embroidery class at my dealer. Looking forward to trying more! I love to do table linens as gifts with initials or monograms! My favorite project to add a personal monogram to is linens as gifts for newlyweds & kids starting out on their own. I have only recently gotten my Bernina and I’ve only used it once so far, so I don’t yet have a favorite anything yet. Although I’m sure I’ll have MANY favorites in no time. at all. Thanks for the chance to win this. Good luck to all! I like to add monograms to towels and handbags. Love to make each bag personal, and sometimes monograms are hidden. I have 2 favorites to monogram. Hats and bags such as makeup bags, pencil holders, etc. It’s so personal and thoughtful. I made a personalized diaper bag that was so much fun! Monograms added to bath towels take them to the next level and make great gifts. That would be tote bags or children’s items. I have twin granddaughters, so an Initial on their fun treats helps to define who’s is who’s. I love doing monograms on towels sets for my great neices and nephews as a gift when they are new born. They don’t grow out of towels. I have 17 great neices and nephews at the moment!!! 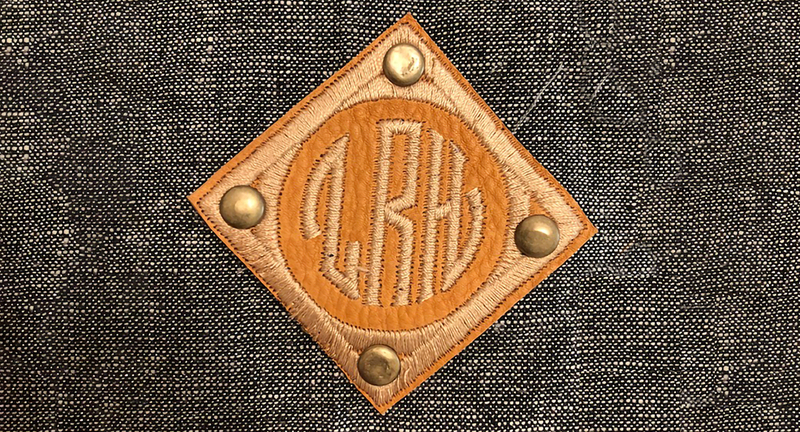 Haven’t ventured forth into machine embroidered monograms yet — looking forward to recreating lingerie bags from linen with the one initial monogram. I want to gift a few special ladies. Nowadays my long ago lingerie bags tend to hold bits and pieces in my sewing accumulation rather than keeping my nylons snag free and my lace bras ready for a quick trip! I haven’t done a monogram yet but I’m now inspired to try it. I’ll probably try hankies first but I love the leather monogram from above and will try it soon. I’m still learning and experimenting with my 770QE, but I recently made myself a poncho and embroidered a floral monogram on the shoulder area. I plan to create a carry-bag for my crocheting and hand-sewing projects which will be monogrammed! I love monograms on a shirt cuff. Just makes it seem so elegant! Just finished an embroidery in the hoop sachet project for Christmas. After making the first and understanding the flow, I substituted a single colored thread monogram letter with floral treatment done in gold metallic. I used my left over wedding dress fabric for the project, a champagne duchess satin fabric and filled it with lavender found on my honeymoon. I enjoying making totes and handbags with monograms. My favorite was an airplane carry-on bag made to exact measurements to fit under the seat in front of me. It’s was quilted, had multiple pockets inside and out and an adjustable strap. People actually stopped me in the airport to ask where I got it. I couldn’t have been more proud, especially since I designed the bag myself. I was able to get a weeks worth of clothing, makeup and a small wallet with cross body strap that I could use as a purse separate from the bag. Love my Bernina(s) and all I get to create! I enjoy embroidering reading pillow bags, tablet runners, and mug rugs. my favorite is to monogram a mouse pad. I like to add monograms to purses to the purses that I make. I love monograms on garments. It reminds me of a blouse I had over 40 years ago with my initials and I’ve always loved that. I want to try the pillow described here, it is just beautiful. Thank you for all the inspiring projects. Towels with monograms make great gifts. My next project is monogrammed “tongues” in Converse tennis shoes. 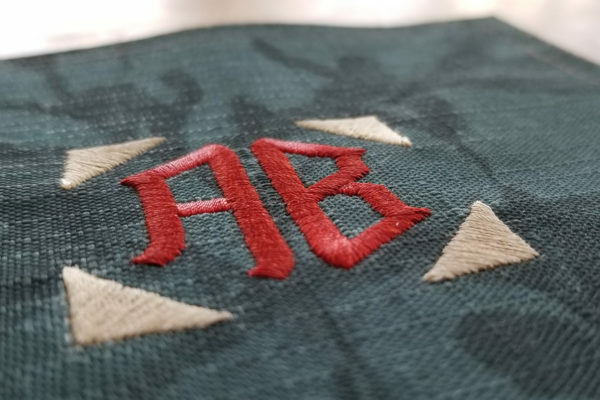 I learned a lot about monograms at Bernina Academy (Ann Silva’s—Albuquerque) today. Mil gracias Sandra Swick! I like monograms on bags. I thought this article was a great source of really updating that idea and using monograms to add a new modern look that I hope to try out soon! My favorite project to add a personal monogram is embroidering decorative initials on a set of personalized pillowcases. I love to embroider pillow cases. This embroidery adds such a special touch and it makes a marvelous gift with little effort. I love monogrammed towels and pillowcases. Definitely towels.! Even my grown son loves them. I really like putting monograms on shirts, especially sweat shirts! I’m a retired teacher, and I liked to monogram my school’s initials on shirts for my friends. I don’t do a lot of monograms but if I do, it is usually on bags. But I have made monogrammed pillows as well. My favorite project is adding a personal monogram to a fabric label and attaching it to a pair of house slippers intended for a family member or guest. Bath towels for all my grandkids! I like to add embroidery designs to jackets, blouses, shirts, tops, and projects. I am enjoying this series on embroidery. I like to monogram luggage tags for guys. For gifts for my artistic friends I like to monogram brush cases or cases for their crafty tools. I enjoy Monograming Jean jackets for children, grandchildren, and special friends. The jackets are timeless personal and worn universally with anything. Having their unique font in the style of their attire makes monogram work especially fun! I like to put my monogram on everything. I am GRITS (Girl Raised In The South). My favorite project to embroider a monogram is on hand towels to give as gifts. Wonderful way to identify my granddaughters’ items without revealing their first names (safety issue). Adds a colorful, decorative touch. With Bernina’s ability to save a design, it becomes quick and easy to do. I love to make small bags as gifts with monograms on them, the pillow pictured is also beautiful and will be put on my list of gift ideas!!! I make, embroidery, and monogram bags for wheelchairs and walkers. They make special gifts. I have put names and monograms on quite a few items. Towels, blankets and sweat shirts for family and friends. Most recently I personalized my grandsons, 3 of them, hockey bags. Now they are very easy to tell apart! I love adding monograms to my three great grands tee shirts. I like the monograms on the sleeves pictured, and would love to learn to monogram towels. I’m currently monograming nursery items that I’m creating: a quilt, sheets, pillowcases, blankets, etc. They look very special! Love to shirts and jackets. Also make quilt labels! As shown in one of your photos, I love monogramming my husband’s initials on the cuffs of his dress shirts. It’s just a small reminder of how much I love him, and he always smiles when he sees it. These are excellent tips for monograms; thank you for sharing with us. My new favorite are towels. When I first learned, we were taught to add a contrast fabric and trim with it, or to embroider the whole name; that left too much of the towel unusable. When I recently purchased my 590, we did a simple single letter monogram, and I love it. I especially love monogramming tone on tone, its so elegant! The single monogram also leaves a great deal of the towel free to use for drying hands. Everyone loves to receive a monogram gift. I make small bags, towels and fleece throws for family and friends. Monogrammed linens are the best. I’ve recently upgraded to a Bernina 790P – I’m in love! I enjoyed monograming golf towels for family & friends. They were well received. Other than the usual towels and pillows, I really like to do small classy monograms on the collar of a turtleneck or on cuffs. I love to make my own purses. I always put my monogram on the inside slip pocket. No one may see it, but I know it’s there. I love to monogram towels as wedding gifts. I have not tried monogramming yet, but would like to try it. I always embroider my initials on crafts – needlepoint, embroidery, and quilts. I love to monogram any and all gifts! Makes a gift personal. The person receiving knows you made it just for them. My newest favorite thing to monogram is a clear clothing bag with a zip front from Walmart. I either embroider the white pressed fiber directly, or add an applique embroidery to it. I love to monogram scarves. Men and women both love them! I love to add monograms to wallets. A little bling for me! I like to make bags as gifts and a monogram is a great personal touch. I love to monogram pouches and travel bags for special gifts. I like to monogram napkins. Thanks for the great tips on embroidering monograms. I enjoy embroidering towels and linens. It really adds an elegant touch. 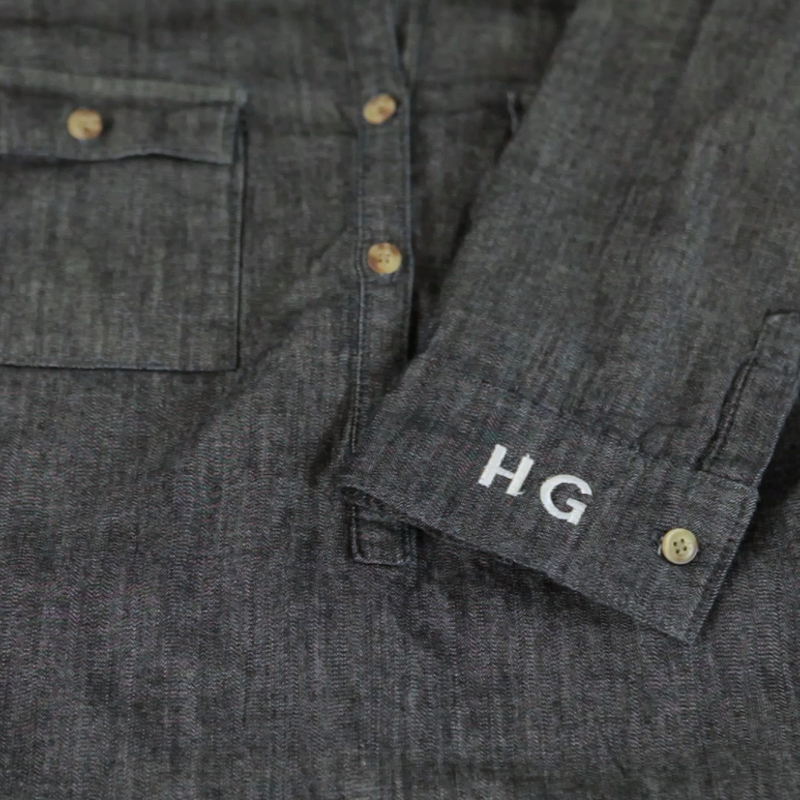 Monograms on men’s shirts and handkerchiefs are so cool! Really makes my man feel like a gentleman! I’m such a little ole lady at heart! LOL!! I love handkerchiefs and in the tradition of southern “church ladies”, I love a monogrammed hankie. They’re so pretty and oh so useful at church! My friends dig them up from all sorts of places for me and I have a wonderful time with them. I would say pillowcases but towels are great too. In the hoop zipper pouches are my favorite thing to monogram. My favorite item to add a personal monogram to is my baby granddaughter’s christening bonnet! It is frustrating to have illustrations for posts like these for Toolbox. 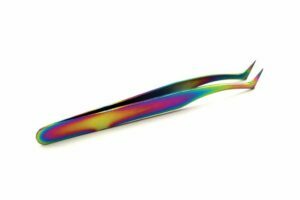 What about those of us who spent a lot of money on Designer Plus? Couldn’t you include at least a link to both? Hello swoozie, there are more embroidery tips to come at WeAllSew, and we do have some focused specifically on Designer Plus. Thanks for tuning in to WeAllSew, and we hope you are enjoying our National Embroidery Month series! Hi, I love to put monograms on nursery items and clothes for my granddaughters. I love to make monograms. I think monogramming towels makes your bathroom elegant. I’m a newbie with my used, 780 Bernina embroidery module, but my favorite project thus far was appliqueing and monogramming Disney shirts for all 11 family members for our recent trip in Nov. 2018. I used a Disney font for the names and they all came out amazing…! It was so easy to locate our little grandchildren in the crowded Disney Holiday grounds wearing look-alike shirts and so many people commented on these unique shirts!! Not bad for a beginner…. I like to add a monogram to baby quilts. Maybe centered in a heart, or as the center of a flower. I love to monogram towels to give as gifts. I purchase mesh tote bags and give as gifts with the persons initial monogram on and a beach emb. They are the perfect bag to carry all your things in for a day or weekend at the ocean or lake. I like to make monogramed purses as special gifts for people I love. I like making quilts and one of my favorite things to monogram is a few blocks, Usually white on white so they blend in but are there. I also monogram a few packages of handkerchiefs for my brother and son every year. Most recently I monogramed fleece blankets for Christmas gifts but can’t wait to make something for my first granddaughter! when we have company to distinguish what towel is being used by who. I always get a chuckle when I see the commercial where the blood hound dog has taken over one of the humans’ towels!! My favorites are bags. But I am inspired by your pillow and think I would like to try that next. I am new to Bernina AND sewing! It all started last year with a 930 Record found in a thrift store, and now I own an 830 computerized model. I love monogramming everything I make, but still learning! I like to monogram towels. I like to use monograms on quilt labels. It adds such a special touch to the label. Newbie here. I ❤️ learning different techniques to make my embroideries better, more personalized gift giving. I love to embroider: towels, napkins, quilts, dresses, jackets, bags, pillowcases & linens, childrens’ clothing, heirloom christening gowns & bonnets. But my favorite items to embroider are hankies. I just finished a quilt with 5 special white hankies….each was embroidered in blush with delicate stitching. The center & largest hanky in the quilt was embroidered with a circle of hearts as a wreath and a 3 letter monogram centered inside the wreath….all stitched in blush color. Thank you Bernina for the fantastic embroidery results using the Bernina 880! I’ve only embroidered bibs so far, but looking forward to personalize bags and towels. i loveto monogram bags to make them more personal, especially if i’m giving them as gifts. I embroider monograms on gift items to make them special for the special people that receive them. Just love my machine and creating. I made a throw pillow with a beautiful B on it. I love my embroidery module. Right now it’s Monograming my granddaughter’s little pillowcases for her pre-K nap time pillow. She’s so proud of it! Love embroidering kitchen towels using “Coffee” themed designs. Such a variety available.